The Days of Johann, an agility dog! : Snake season has arrived! 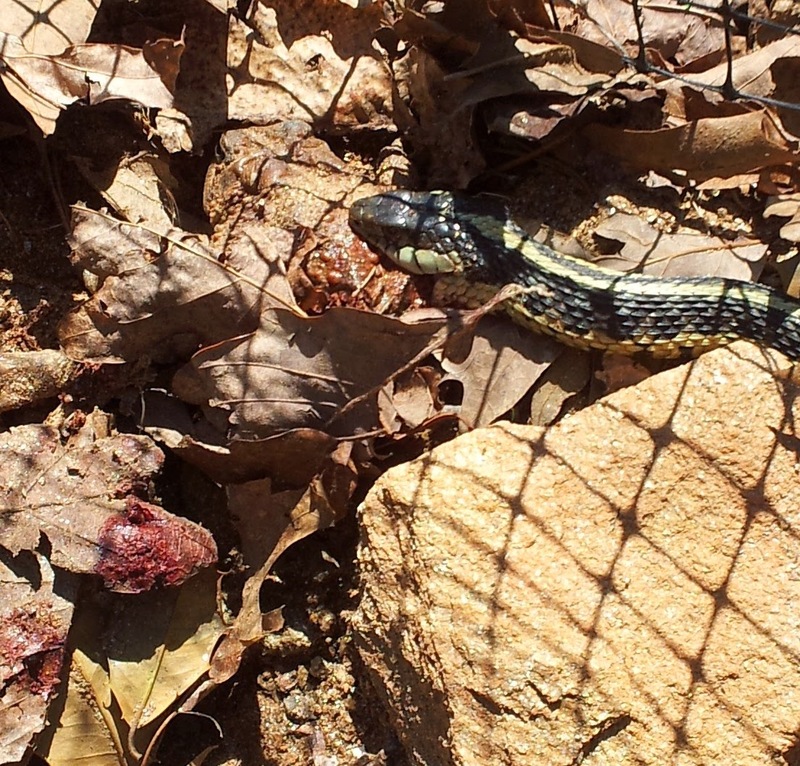 Snake season has arrived here on our mountain with the warmer temps and the nice sun! A couple of weeks ago, Mum, Gracie and I were hanging out enjoying the nice weather, when I spotted something along the south fence line. Earlier that day, Mum had spotted one of the many toads that we encounter and had helped him/her over the other side of the fence. This is the same type of toad that had given me a little toad toxin poisoning last year, so Mum likes to keep them away as much as possible. Larger versions of the Bufo (aka Cane Toad) can be very dangerous to small dogs. These are mostly located in Florida and other surrounding states. 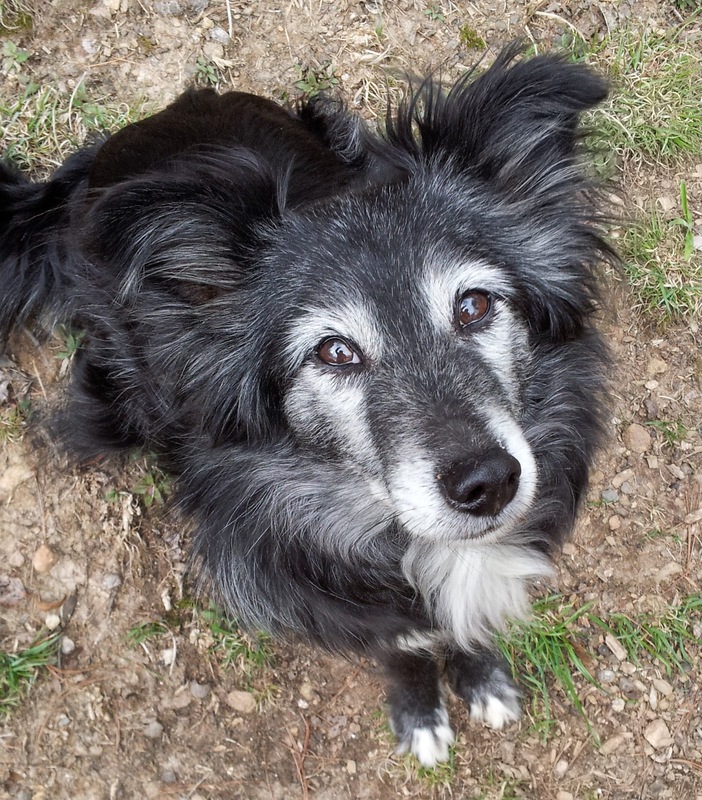 We're lucky that these little guys only give off a little toxin when annoyed (like when I or Gracie paws at them). When that happens they swell up and start secreting the poison from those odd warts on their backs. 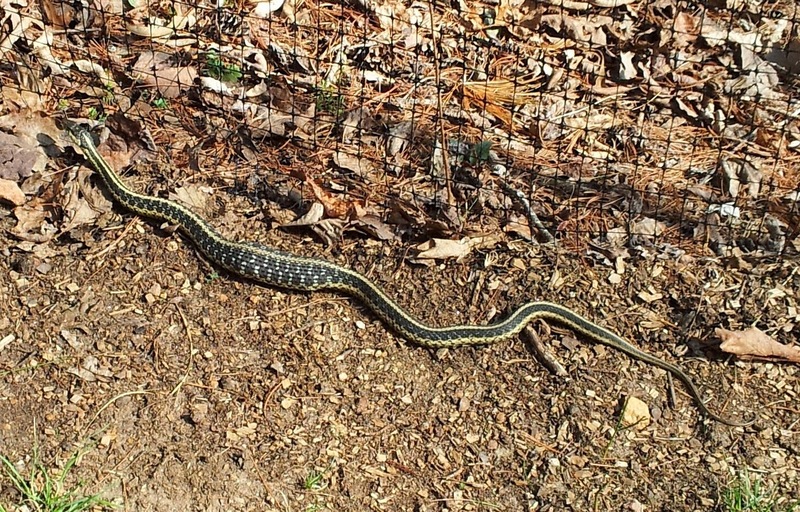 When Mum investigated what I saw at the fence line, she saw one of the several garter snakes we see here on our mountain. They like to scavenge for mice and, as we found out this day, toads. They are good snakes, and Mum doesn't like to hurt them, just relocate so we get used to not bothering them in case some day we encounter a copperhead which would be much more dangerous for us. Mum saw the snake and when she looked closer she saw some red stuff on a leaf near by. Then she looked closer and what?!? There's a toad! And that snake is going after that toad? Who knew that toads bleed red? We didn't! With Gracie and I at a distance, Mum watched as the snake started to 'eat' the toad. You can see in the video below (Spoiler: If you have a squeamish streak, you may want to shy away from watching). Mum thought, how in the heck is that snake going to get that big toad in his/her tummy? Later that afternoon, she found out when she saw that the little snake was still in our fence, and couldn't get out of the fence because he/she was too fat! We worked on our snake avoidance training a little (always a good refresher at the start of the season and throughout) and then went in to eat our dinner. When we came back out we saw that little snake had crawled out the fence from underneath the bottom of the fence, and we were off to play in our snake free yard once again! Our mom can't stand snakes! We haven't seen any this year yet but we know it's just a matter of time before they're out and about. YUK! What a fascinating post! Those cane toads are a terrible problem in Australia, because they were imported to solve some problem, long ago, and now have no predators. They are gradually spreading south, towards cooler areas, as the climate changes. I thought the cane toad was still alive while the snake was eating it - poor thing. So does the snake poison it before swallowing it? BTW, I'm hoping out snake season is finished. Good question! We looked it up and seems that garter snakes are immune to the poison from toads. No fair!!! Well, maybe we need to import a few garter snakes.